Staff at Cessnock Golf Club have been left frustrated and angry after another senseless vandalism attack on the course. Last Monday (January 14) vandals entered the grounds of Cessnock Colf Course – also known as Stonebridge – at some stage between 7.30pm and 5am, pouring what was believed to be diesel fuel in a wide, arcing horseshoe shape on the course’s fourteenth green. Course superintendent Merv Hayward said that the damage would take more than a month to repair. 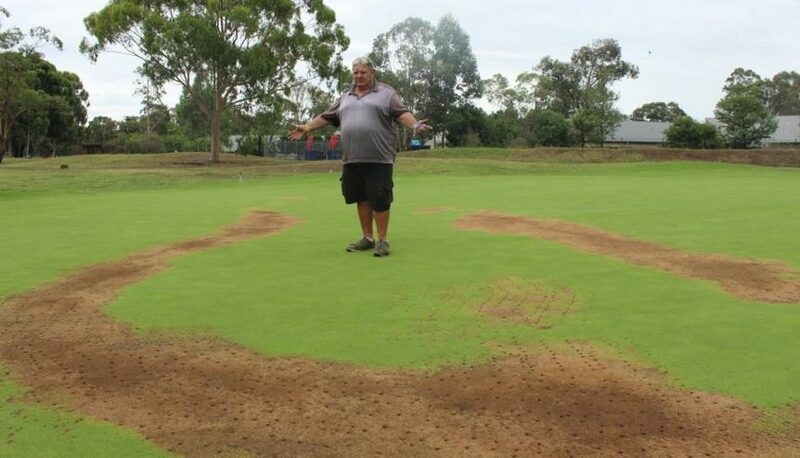 Mr Hayward said the attack was the latest in a string of incidents at the club over the past few weeks in which damage had been done to the fifteenth and fourth greens. IRREPARABLE: The evidence of a previous vandalism attack at Cessnock Golf Course in February 2018. While he is unsure of who is behind the attacks, Mr Hayward said he believed it may be school-aged children due to the timing of the vandalism. “Nothing will happen for three or four months and then it seems to start up again. Club Captain Peter Conroy echoed Mr Hayward’s sentiment. “It’s very frustrating,” he said. “You give time to the club, you give a number of days a week and we’re getting new members, the course is in good condition and then you see something like this. Mr Hayward added that he would like to see those responsible own up and take responsibility.